Over the course of the past month or two, you may have seen a series of articles from our engineers on open source libraries. These libraries are aimed at accelerating math calculations for high performance computing, using GPUs and OpenCL™. You can read the blogs here. These point releases were not random. There is a method to our madness. We have just announced the AMD Compute Libraries (ACL) as an open Beta. You can learn more about the Beta 1 of ACL here. All the source code, readme files, and documentation are available in GitHub. Each of the clMath libraries we wrote about is a component of ACL. I have told you elsewhere about AMD’s commitment to open source software. ACL provides developers with a growing collection of open source libraries designed to enhance the performance of your code, whether it is running on a GPU or on a CPU. As part of this ongoing effort, on the CPU-side we are transitioning the AMD math libraries from the proprietary, closed source ACML codebase to the open source, BSD-licensed SHPC libraries. The Science of High-Performance Computing group, based at The University of Texas at Austin, developed and maintains the SHPC libraries. That’s right, AMD’s formerly proprietary high-performance math library code is moving to open source. The BLIS framework provides a high-performance BLAS-like API that replaces the BLAS API provided by ACML. The libflame library also provides a high-performance LAPACK-like API that replaces the LAPACK API provided by ACML. AMD-provided math libraries are now available under either Apache or BSD licenses. Removed the inconvenient dependencies on the Fortran runtime. The source for both BLIS and libflame is written in C, or in assembly where performance requires. An expanded API that is a strict superset of the traditional BLAS and LAPACK libraries. BLIS and libflame provide a wrapper for programs written to the older ACML API. A native API that offers the potential for greater acceleration, for programs willing to interface with the native API. Optimizations for the latest 6th generation AMD A-series processors (code-named “Carrizo”), have been checked into the master branch of the BLIS GitHub repository. 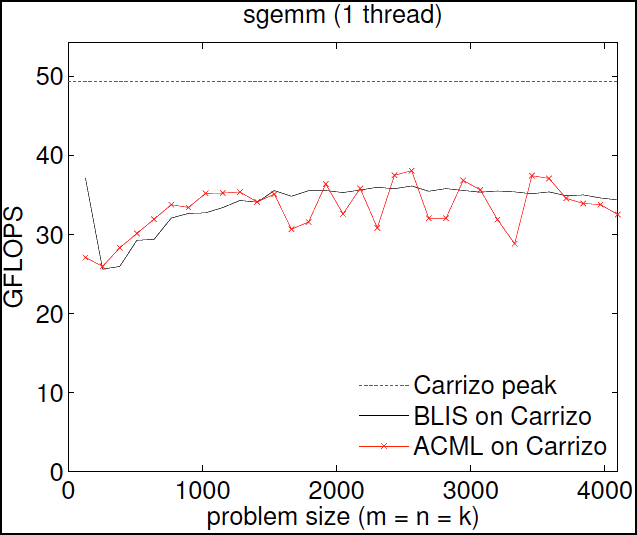 The “Carrizo peak” line is the theoretical maximum performance measured in gigaflops on the processor. The results show how the move to BLIS has caused no loss in overall performance. AMD will continue working with the Science of High-Performance Computing group to bring further functional and optimization improvements for AMD hardware in releases to come. For those wishing to get started with the BLIS framework, an overview and getting started guide are available at https://github.com/flame/blis. The SHPC software stack was funded, in part, by the National Science Foundation’s Software Infrastructure for Sustained Innovation. Jim Trudeau is Senior Manager for Developer Outreach at AMD. Links to third party sites and references to third party trademarks, are provided for convenience and illustrative purposes only. Unless explicitly stated, AMD is not responsible for the contents of such links, and no third party endorsement of AMD or any of its products is implied. OpenCL is a trademark of Apple Inc. used by permission by Khronos. This is great news! Could you please supply a comparison for the A10-7850 using DGEMM? Thank You. The short answer is yes, to both questions.. We have contributed code to BLIS and expect that will continue. I have passed your comment on the environment variable settings to the team. Thank you for the feedback. Well done on a smart decision. Pleased to see also that it is a C driver – aids cross platform/language use (ms/android/linux, c/java in my case). Thanks! Glad we can help, and appreciate the feedback.